Whether capturing images in the studio or on location, the Vello FreeWave Wireless Remote Shutter Release for Canon and Panasonic Kit from B&H Photo adds flexibility and versatility to your shooting style. This kit includes the Vello FreeWave Wireless Remote Shutter Release for Canon W/3-Pin Connection and a Vello FreeWave Camera Release Cable for Panasonic Cameras. The cable makes it compatible with Leica V-Lux 4 and Panasonic DMC-GH5S, DMC-GH5, DMC-GH4, DMC-GH3, DMC-GH2, DMC-GH1, DMC-G9, DMC-G8, DMC-G7, DMC-G6, DMC-G5, DMC-G3, DMC-G2, DMC-G85, DMC-G10, DMC-G1, DMC-GX8, DMC-GX7, DMC-GX1, DMC-L10, DMC-L1, DMC-GF1, DMC-FZ2500, DMC-FZ1000, DMC-FZ300, DMC-FZ200, DMC-FZ150, DMC-FZ100 cameras. Photography unplugged - shooters can interact with a model, view the scene or set from alternate angles, or set a camera by a stream to capture an image of a bear hunting while you remain at a safe distance away - all this and more without missing a beat, a shot, or a moment. This particular FreeWave unit is compatible with Canon cameras with a 3-pin connection, and Panasonic cameras. This versatile shutter release features Smart Code technology which allows it to be configured to operate on up to 16 million possible radio channels. You can easily switch channels to "zero in" on a frequency that provides optimal range and functionality. The FreeWave operates with radio frequency (RF) technology, therefore a direct line of sight is not necessary; radio waves pass through objects such as windows and walls. It is unlike other wireless remotes on the market that operate on an Infrared (IR) system and require a direct line of sight between transmitter and receiver to make things work. Since touching the camera even lightly while capturing an image can create a blurred image, the FreeWave eliminates this by tripping the shutter without any disturbances. This is critical when photographing subjects close up, and for long-exposures and macros. It is also extremely valuable when photographing nature, wildlife and other subjects that are difficult for you to get close to. Whether capturing images in the studio or on location, the Vello FreeWave Wireless Remote Shutter Release adds flexibility and versatility to your shooting style. Photography unplugged - shooters can interact with a model, view the scene or set from alternate angles, or set a camera by a stream to capture an image of a bear hunting while you remain at a safe distance away - all this and more without missing a beat, a shot, or a moment. This particular FreeWave unit is compatible with cameras with a 3-pin connection, i.e. Canon 1D series, 5D, 6D and 7D series DSLRs. The FreeWave's Smart Code feature allows you to operate on 16,000,000 possible radio channels. No DIP switches need to be set, and one transmitter can trigger multiple receivers. The units have been synchronized at the factory, so your system can work right out of the box. However, to maximize signal quality and range, it is best to use the Smart Code technology to sense the "quiet" frequencies in your environment and re-synchronize on that channel. You can take multiple shots with one press of the trigger. The FreeWave includes a camera release cable that works with your particular camera model. By simply changing to another cable (additional purchase required) a single receiver can work with many other cameras as well. This Vello 2.5mm Remote Shutter Release Cable is a coiled cable for connecting a Vello remote shutter release receiver or other remote receiver with a 2.5mm jack to select Panasonic and Leica cameras. Box Dimensions (LxWxH) 8.6 x 2.9 x 1.2"
FreeWave Wireless Remote Shutter Release for Canon and Panasonic Kit is rated 5.0 out of 5 by 2. Rated 5 out of 5 by Tony from Excellent telephone service with helpful advice This unit allows for no-touch and/or wireless remote shutter release. Can be used as a cable-connected unit also. Well constructed and compatible with a variety of cameras. In my case a Lumix DMC G7. Such releases are hard to find and, from what I hear, not always reliable. The advice I received prior to purchase was extremely helpful. Rated 5 out of 5 by Jackkennan from I bought this product again. Gave this wireless remote as gift for my nephew who enjoys photographing nightscapes with car lights (streams) with his camera mounted on a tripod. I noticed he had been pressing the shutter manually which adds vibration, so just wanted him to have better results with the addition of a remote shutter release. I have been using one on my own camera and it has worked flawlessly. I use it for landscape and night scape shots, and once used it to photograph several birds enjoying the birdbath in my back yard. I set the camera on a tripod not far from the action and then sat inside my house using the remote shutter through a dual pane window. With radio frequency, the window was not an obstacle. It boasts a 320ft. range, but I don't ever plan to put that much distance between me and my expensive camera gear. what are the plug sizes? are they compatible for shooting video? I have a Panasonic DMC-FZ1000. The Vello FreeWave Wireless Remote will only be compatible for shooting stills. This particular model will not be compatible with the Panasonic DMC-FZ1000. Will this work with the Panasonic G9? Yes, the Vello FreeWave Wireless Remote Shutter Release for Canon and Panasonic Kit, B&amp;H # VERWC2PK, would be compatible for use with the Panasonic Lumix DC-G9 Mirrorless Micro Four Thirds Digital Camera. I have a Panasonic GX8 camera. This product indicates it works with the older GX7, but does anyone know it it will work with the GX8? Yes, this will be compatible with the GX8. Can I trigger two receivers with one remote? Yes, you have to synchronize each transmitter and receiver pair by setting the Receiver to ready then pairing the Transmitter to it (like pairing a Bluetooth). Then repeat the procedure for the second Receiver. Hello, Will this work with the Panasonic DMC-G7k? I have a Canon, and the documentation said that you only need to change the cable that plugs into the camera. I would think if you got the right one, it would work. Will this work with a DMC FZ200? how do u mount the receiver? hotshoe? n can u conntect the receiver directly to the camera without the cable ie thru the hotshoe?? The receiver is mounted to the hotshoe, yes. With this remote shutter release you cannot connect the receiver to the camera without the provided cable. I was wondering if this unit is compatible with with the Canon EOS 5D Mark II and the 7D. The FreeWave Wireless Remote Shutter Release for Canon and Panasonic Kit is compatible with the Canon 5D II and 7D. 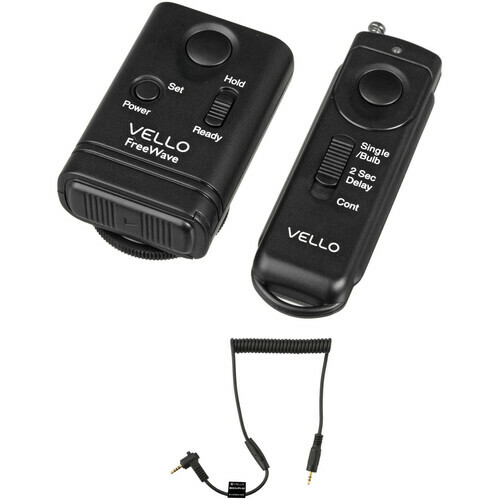 Though, you could also use the Vello FreeWave Wireless Remote Shutter Release for Canon w/3-Pin Connection (B&amp;H # VERWC2), as you dont need the Panasonic cable that comes with the other kit for either the 7D or 5D II.